Yesterday, I reported that I made the move on my AT&T Tilt to the official release of Windows Mobile 6.1 by HTC Europe for the TyTn II. I initially tried Dutty's 6.1 test ROM from xda-developers which had many issues, today I noticed he had appended his post title with "[AMBANDONNED DUE TO BUGS]". The HTC ROM I downloaded from via this post on MoDaCo, seems to be running very well. It does not have the bells and whistle that Dutty's ROM had but I was able to make the tweaks I needed with Kaisertweak. I also ran the Tilt Keyboard fix to make the Tilt's keyboard work correctly. I also updated quite a few applications. My one disappointment so far was the fact my backup with Sunnysoft's Backup Manager did not restore correctly and I had install all my applications manually, but it does give me a clean environment. Update 5/30/2008: On 5/29/2008 I had problems accessing the Internet with PIE, rebuilt my Tilt and removed the United Airline PocketFly application for fear of incompatibility with Pocket Internet Explorer in 6.1. I will have to test further. Since my last update I decided to use the GeeksToolbox.com SiriusWM5 application to listen to the Sirius (see my post). I also upgraded Spb Mobile Shell to version 2.0 (see my post). duttythroy has a great library of application cabs here. JETware Hands-free Bluetooth extension for Windows Mobile has been an invaluable piece of software to synchronize my device with my BMW in car ULF Bluetooth system. It allows me to synchronize my address book by category, view text and email headers on my navigation screen, display caller id information, and provide the appropriate status information for no signal and roaming. The software license is locked to your IMEI. I have been using it since my T-Mobile MDA and have switched phones several times. Each time I would send an email to support with my new IMEI and within 7 days I would receive a new activation code. In December I did the same for my new Tilt, however I never received a response. JETware did create an automated system to switch IMEI but for some reason I am not in the system (probably because I was an early adopter) and since support won't answer I am stuck. Watching the JETware forums, it seems I am not the only one having support issues ignored. What happened to the developer? He was offering a great application at a very reasonable price, maybe he was not making enough to invest the time required to properly support the product, just a hunch since selling Windows Mobile software is a tough and not necessarily a money making business. If that is the case he should say so and maybe offer his software to the open source community (xda-developers) so everyone can benefit. My 30 day trial is now up and I to continue using it I have to purchase another license. In the end I don't have that big of a problem spending $14.95 (I need it), however that was not the deal when I originally purchased the product. I think JETware owes users an explanation of what happened. If anyone knows please comment. As I reported on Monday, I flashed the radio ROM on my Tilt with 1.27.15.32 off of the newly released HTC ROM. This radio ROM seems to provide noticeably better GSM signal strength. The downside is slow GPS acquisition time, but that is OK given the improvement with the GSM reception. One other note about the GPS, if you cannot acquire your position, such as inside a building rebooting seems to be the only solution to get it going again when you step outside. Dutty released V4 of his custom ROM and I may update this weekend. Since I don't have any major issues with V3, I am not chomping at the bit to upgrade. Dutty is working on a WM 6.1 upgrade, I may just wait for that. I will report back on my choice later. I just updated Zagat To Go to version 6. The OTA download at m.zagat.com is temporarily unavailable, but I downloaded it from the Handmark website. This update should provide a better solution for dialing the establishments directly from Zagat To Go. It is clear that the Bluetooth headset volume is an issue with the Tilt and you need to use a headset which has some amplification capability such as my Blueant V12. I am satisfied with the volume, although I have it set to 10. I have not tried it in a very noisy environment. PhatWare's just announced the release of CalliGrapher 8.6. This is a free upgrade to users of CalliGrapher 8.x. I have been using Calligrapher on my Windows Mobile device since before the days of integrated keyboards. With my Tilt, I still use it quite a bit switching between the keyboard and handwriting using CalliGrapher's Write Pad. Calligrapher has gotten better with every version. Version 8.5 recognition was very good but slow, hopefully 8.6 will speed things up. When I installed PhatPad 4.4, PhatWare also include their PhatUpdate utility which can update their software as well as WebIS' over the air. I used it to update CalliGrapher. I will report back next week how I like version 8.6.
pocketpcthoughts.com is offering a great opportunity to get Pocket Informant 2007 Revision 4 for free today and tomorrow. Follow this link and use coupon code PIFREE. 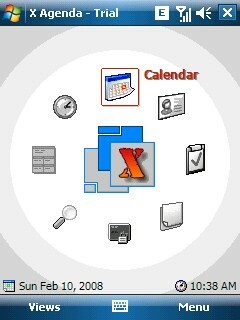 If you have not used it, try it you will never go back to the Microsoft PIM. My new AT&T Tilt has brought a new environment with a host of updated applications found in Dutty's DualTouch ROM. I am pretty much using the same set of applications I have been using. The one very nice feature of the ROM is that applications like Battery Status and Total Commander are included in the ROM (I added an In ROM section). With over 110MB of available Program memory I have installed all of my application in Program Memory. I am currently at 88MB, which is excellent. This leaves my 2GB free for media and documents. I tried to use the HTC Home screen but found that the spb Mobile Shell was still superior along with PocketBreeze. So my Today screen remains the same. There is very nice utility called AdvancedConfig version 1.1 which allows you to tweak all of the performance variable and suggests appropriate settings. Eventhough Dutty's post on xda-developers says that the .NET Compact Framework 3.5 is installed in ROM, I had to install the .NET CF 2.0 for Zagat To Go and the AdvancedConfig utility reports .Net CF version 2.0.6129.0 so I am not sure what is going on..
Office Mobile 6.1 has now been officially released for Windows Mobile 5.0 Pocket PC and Windows Mobile 6 devices. Ability to view and extract files from compressed (.zip) folders"
This upgrade only works for Windows Mobile powered devices that have an earlier version of Office Mobile. If your Windows Mobile powered device does not have Office Mobile applications, this upgrade will not work for you. You can purchase Windows Mobile full Office Mobile suite from handango. The .msi install is available free from Microsoft here. Bobby on Why do some Blu-Ray movies display in letterbox?